The automobile should not have any problems starting. After starting the automobile, get out and listen for any unusual noises. The automobile should idle smoothly and quietly. The automatic transmission dipstick is similar to the oil dipstick. It is sometimes labeled ATF (see: Section D, Oil). Wait for the engine to warm up. Unless the owner's manual directs otherwise, allow the engine to continue running throughout this procedure. Shift into each gear and end in “P” (park). Pull the dipstick out, wipe it with a rag and put it back in all the way. Pull it back out and check the dipstick. It should read full. If it is low, this could mean trouble. Have the mechanic look at it. The color should be clear or bright red. Dark brown or black fluid that has a burnt smell indicates the need for an overhaul. This is also true if you find any particles or bubbles in the fluid. If you hear any of these noises, in this or in any following section, describe the noise and explain the circumstances in the area for comments. Try to locate the general area from which it is coming. This is not a complete list. If you hear a noise that is not listed, try to find a word that describes the noise. 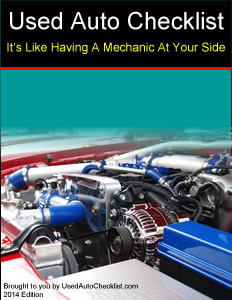 It may seem silly, but these observations will help the mechanic in his or her inspection.